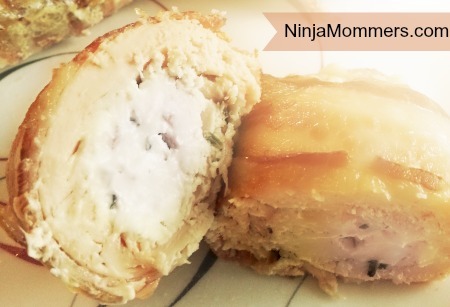 I am not kidding when I say these are the best ever slow cooker chicken breasts I have had to date. If you are watching your figure they probably aren’t really all that diet friendly, but hey, everyone needs a cheat day. What better way to cheat than with bacon and cream cheesy goodness? I certainly couldn’t tell you one. 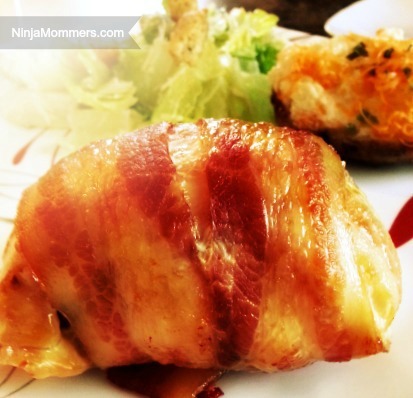 These Bacon Wrapped, Cream Cheese stuffed Chicken breasts are really a fantastic addition to your slow cooking repertoire as they melt in your mouth! Unfortunately they don’t just melt off your hips, but it’s SO worth it for one night. I am in love with cooking this, it takes almost no time to prepare and the voila they are in the slow cooker reaching juicy, delectable goodness. 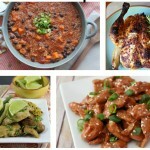 I love slow cooker meals as I find I have more energy at the start of the day. If I get dinner on in the morning by the time I am exhausted and lazy feeling by the end of the day, we still have a meal, and it happens without me complaining the whole way through! Mmmm, It’s not even cooked yet and it looks good. Plus, you can’t lose with the wonderful aroma of cooking bacon drifting throughout your humble abode. This is so yummy and moist that I could eat this every single meal, but that would not be healthy so I will let it happen only once in a while on cheat nights. As this yumminess is cooking it creates the best aroma ever, I can smell it from my living room and it makes me hungry all day! Mmmm Bacon…AND CREAM CHEESE…. Right!? So Without Any Furthur Ado… I present the Recipe! In a microwavable bowl soften 3/4 cup of cream cheese. 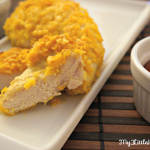 Smack the Chicken Breast around- no really, pound it out! If you do not have a meat mallet just do what I do and use a hammer. Pound it out until it's about 1/2 an inch thick. Season Chicken Breast with a pinch of pepper, place a 1.5 -2 tbsp of the cream cheese mixture in the center of the flattened breast. Wrap 2 Strips of Bacon around the Chicken, ensuring that it covers the open ends. 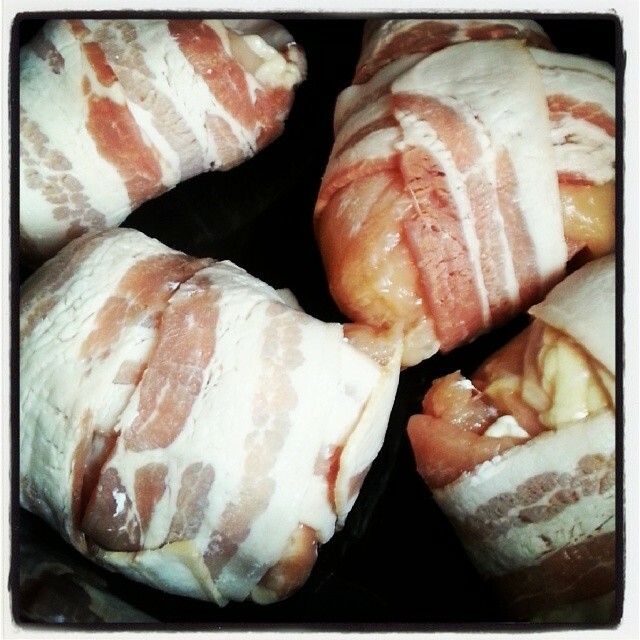 Great Tip: When wrapping Chicken with the bacon make sure to overlap ends of bacon to ensure the bacon stays wrapped. I am having pot luck for 12 people. I do not have a slow cooker large enough. Have you ever put a single layer in a large pan and put in oven on low for several hours or more? This sounds so yummy. Wow, this recipe looks amazing! I can’t wait to try this! Holy hannah! My hubby would devour this in one fell swoop! I will be sharing this with him today! What a GREAT idea 🙂 Yum! Oh my!! Looks SOOO good!! I need to make this soon…lol. Anything wrapped in bacon is a MUST hehe. So I commented on this earlier this morning and forgot to pin it. Then I went grocery shopping, bought all of the ingredients, got home and couldn’t find this post LOL. Thanks for a fellow FB friend who helped me find it and now my chicken is in the oven! Thank you so much. I’m going to be blogging about this and will be giving you credit for the recipe 🙂 Thank you SO much! Hi Mary! I think swapping chives for jalapenos would be amazing! In terms of making a large batch, yes you can layer them! I have done it before and didn’t have a problem with them sticking together. I Would say to cook a little longer though, anywhere from 8-10 hours on low heat. Just make sure to check the chicken is cooked with a meat thermometer. Please stop back by and let me know how it turned out! Just got my first crockpot and I just made this and put it in!! So excited!! Just wondering.. Since its later then I hoped to get this done is there a hour time so I can put it on the high setting? Thank you! I am so sorry that I didn’t get back to you when you were making this Maggie! I hope it turned out delicious! 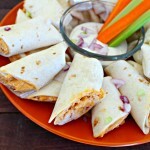 Looks so yummy, but does the bacon really get crispy in the crock pot?? Yes well I will definitely be making this before I have my blood test for High blood pressure and cholesterol because hello!! What a great combination! Crazy impressed. Uhm hello… Chicken, cream cheese and bacon you say?! Oh and to boot I set it and forget it in the crockpot? Hell ya! I am making this for today! i cut slits in the chicken to stuff it and actually made the cream cheese mixture with cut up broccoli!! can’t wait to try it! Oh that sounds delicious too! Please let me know how that turns out! Thanks for letting me know you’re trying it! Looks so delicious. I only have one silly question, do you put any stock or other liquid in the slow cooker? If so how does it go crispy? This sounds delicious. However, I will use fat free cheese seasoned with minced garlic, basil, and chives. Mmmm, good. Cooked this today , as expected sooooo dry . Don’t waste your time or money in prepping this chicken . It depends on the slow-cooker I guess. Ours have never turned out dry! In fact they have always been moist aND delicious. Thank you for your input though! 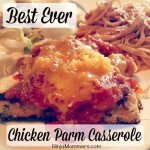 Hi, this recipe looked so yummy I have it in the crockpot now for dinner. I’m hoping it tastes as good as it looks, There is a lot of liquid in there right now,so I was wondering if some of it needs to be drained to crisp up the bacon? I used thick sliced and it didn’t seem too fatty. 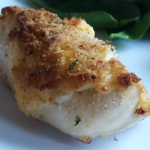 I am planning a dinner for 4 in Sept. and I’m doing a trial run so if you have any other tips please let me know. Thanks so much for the recipe and any advice. Newer to slow cooking. You shouldn’t have to drain. We never have, bacon crisps nicely towards the end but the liquid helps to keep the chicken moist. Just make sure to check the temp on your chicken. Don’t over cook. Sometimes depending on the slow cooker 8 hours can be too much so a meat thermometer is your best friend. Hi. I’ve got a 6 quart slow cooker. Does the size of the pot depend on the cooking time? Or will it stay the same? This probably woulsnt work with turkey bacon right? I can’t see why not, but I can not be sure as we have never tried that. Sounds like a great idea though, I love turkey bacon. If you do try it this way, please let me know how it turns out. Ooohhhh I love everything with bacon,bacon and bacon. I didnt have chives, thus i mixed Herbs de Provence in the cream juice. Hope it will be as savory. Just placed it in the crockpot in time for brunch after church today! ! Excited how it will.turn out. Thank you for your feedback. We have never had this problem with this recipe, the bacon always crisps nicely for us in the slow cooker. We have also never had a problem with the Chicken being too dry, if you did it in the oven however, how long did you cook it for and what temp? We don’t have any directions for the oven version so that may have just been a case of it being over cooked. Where does all the bacon fat go….? Do you drain the bacon roll? When putting in crock pot do u put water or anything in it if so how much? Itll ne cooking while i am at work. Thank you! I’m not a fan of cooked creamcheese..it makes me gag..could I substitute ricotta? If you’re on a Ketogenic diet then this isn’t fattening! Going to try Dijon. 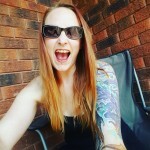 I’ve lost 52 pounds so far! I’ve made this once and it’s absolutely delicious! I did however throw in a few of my own ingredients to add more flavor such as jalapeños, minced roasted garlic and sun dried tomatoes along with seasonings for the cream cheese! My question is, is it ok to cook on high for 4-6 hours? Great recipe. Although I am a bit confused as to why it is labelled as unhealthy? Come on people, those studies about animal fat and cholesterol have been debunked a long time ago. 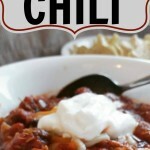 I have been making this for years in the stove & on the grill, I never thought of doing it in the crock pot! We have always used bakers twine to tie them so they stay together. I can’t wait to try this. cheese slices and basil leaves wrapped in bacon. Would this work well ? I found that most of the cream cheese leaked out…did anyone else have this problem? This does happen sometimes. It is really important to ensure that you seal the ends with the Bacon. If you have larger pieces of chicken maybe a few additional pieces of Bacon would be beneficial. I apologize that this happened! Mmmm….I can’t say that I’m not currently drooling, lol. Looks absolutely delish! So I’m trying my version of this (almost identical to yours) But I’ve also added a mixture of maple syrup and brown sugar brushed on top of the bacon after it was placed in the slow cooker. MMMMMMMMMmmmmm. Jeremy that sounds like an amazing idea. I love the combination of maple and brown sugar with Bacon. I am going to have to try it like that too! I made these and froze them before cooking. I froze them on a tray and then once frozen I put them in a freezer bag. When it came time to cook them I put them frozen in my slow cooker and cooked on low for about 7-8 hours. They turned out fantastic! So yummy!